Grounded in stable growth and local partnerships. 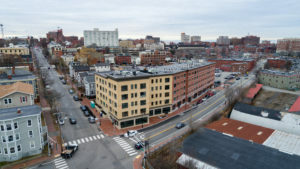 In response to the changing dynamic of Portland, J.B. Brown & Sons has gradually expanded its original holdings located primarily on the waterfront to include properties on the city’s perimeter and in the Maine Mall area. Today we own and lease over 20 area properties and we are in the process of two more major development projects. Focused on stable growth and perpetual ownership, we see each property as a long term investment. J.B. Brown began as a family-owned company, and remains privately held, with a large percentage of its ownership retained by descendants of its founder. We know that Portland’s economic growth is vital to our continued success and we invest in the local community by building local partnerships.